My visit to the Sabra Headquarters was a long time coming. Awhile back at a mom's and pop's grocery shop in Maryland, the owner gave me the lowdown on the newly built facilities in my own very state. The pop of the mom and pop duo heard all about it from his distributors. From that point on I couldn't shake the desire to get a behind the scenes peek at the state of the art new facilities, just a stone's throw away from my little house in a wooded area, outside DC. Sure enough, that call came when least expected, months, if not years later and I jumped at the opportunity to be hosted by Sabra at its Headquarters just outside Richmond. I grew up on hummus and passed on the love for this smooth, creamy and highly nutritious garbanzo bean dip to my son, through his school lunches. My son's sandwiches in his lunch box were so attractively delicious that his buddies begged him to trade off, but he wouldn't. Once in awhile I would send extra to share. So it went like this: a freshly baked flat pita bread called laffa, smeared generously with Sabra hummus, a touch of harissa, brined pickles sliced thinly lengthwise, some added thinly, yet again, chicken breast or healthy cold cuts, all rolled up in a wrap. Then sliced in angle right in the middle for an appetizing school lunch presentation. Arriving in Richmond was educational. I did some prior research and asked about the green aspects of the new facilities. I was impressed that they had a rain water collecting tank used to water the landscaped grounds. I was curious what type of chickpeas they use? Is it the small Turkish variety? Do you peel the skin off after cooking and grind the cooked chickpeas into a desired consistency? Throughout our walk on the plant floor, I was on the lookout for that massive elusive grinder but non was in sight. Turns out the massive industrial size kitchen contraption was a figment of my imagination. After cooking the chickpeas, they are so soft, they just melt into a paste. No peeling, no grinding. No muss, no fuss! It diffused some of my beliefs and burst some hummus legendary bubbles.Turns out it is a small variety of chickpea Sabra uses, grown in the United States. Legend has it the small chickpeas are the best but am not sure these ones are necessarily of the Turkish descent! There are so many highlights to my overnight trip to Sabra, just outside of Richmond, I didn't even recount my accounts from the start and now in need to shift gears in reverse, so hold on tight to your dear life, for a whirlwind of classic hummus, jalapeno hummus, luscious lemon hummus, and supremely spicy hummus, the flavors are innumerable! Sabra's in house chef, MaryDawn Wright introduced the new upcoming flavors, the Asian fusion garden hummus, it was one I just couldn't imagine, but then I tasted the ginger notes and the consistency of the fresh ginger garnish crunch and was hooked! I can't promise I won't raise an eyebrow, again. Remember I am a cynic first then a convert, and we converts are die hard! In the name of further disclosure, I loved meeting everyone at the Sabra shindig, especially Nelly. We hung out at her hotel room before heading out to dinner that first evening. I was famished and she offered me a delicious power bar she had in her stash of snacks. Honest to goodness it was spiked as otherwise how would you explain my 'cheery' behavior on the party van, oops, van ride over to the restaurant?! Follow and join the conversations on twitter @foodwanderings, befriend Shulie Foodwanderings on FB, Like FoodWanderings FB page and oh I love Pinterest too, Shulie Madnick! Chefs note: Caramel can be prepared up to 2 days in advance. Purchased caramel can be used if you do not have the time or temperament to make caramel on the stove top. Filling is best made the day it is served. Do not fill cups more than an hour before serving. Place sugar and caramel in a heavy bottomed sauce pan. Cook over medium heat until sugar begins to brown. Watch very closely, stirring infrequently. When sugar is a deep brown (but not burned looking! ), remove from heat. Immediately and carefully add cream. Stir well. Add butter and vanilla. Stir until well blended. Pour into a storage container and refrigerate until ready to use. Mix all filling ingredients together. Refrigerate until ready to use. 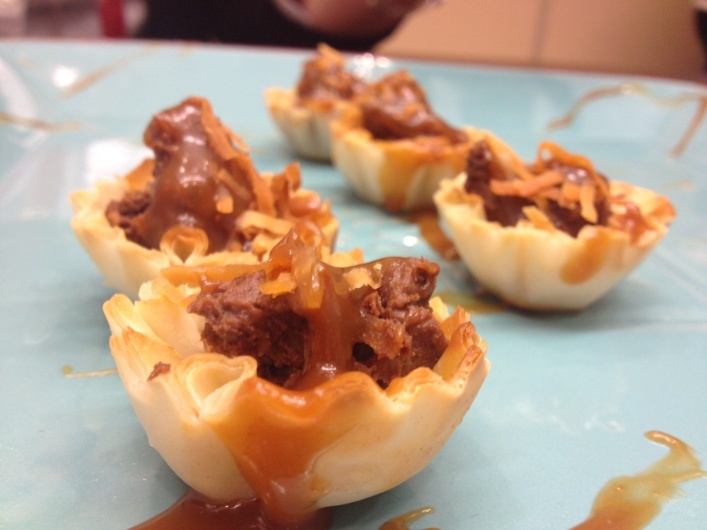 Spoon a rounded teaspoon into phyllo pastry cup. Top with a rounded teaspoon of caramel. Sprinkle with toasted coconut. Place on serving platter. Drizzle pastries and platter with caramel. Serve immediately. An interesting combination and creation! Those are really intriguing and surely delicious. I know, right?! It was absolutely sinful! What a unique pairing of flavors...bet it is just delicious! Yummy! Thanks for share. Keep up the good work. How creative! I'm loving your chocolaty hummus bites. Wouldn't they be perfect for a party?! 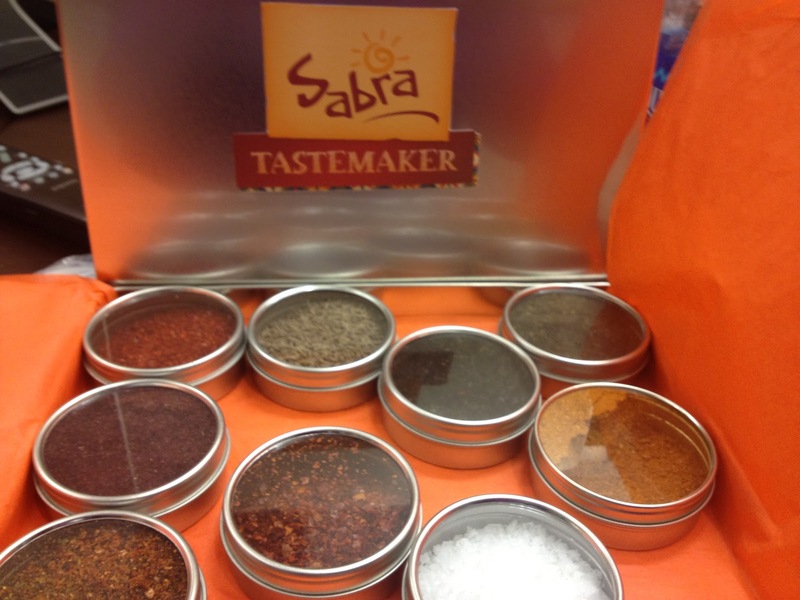 i had no idea Sabra is here from Richmond. And I had no idea you can combine hummus with chocolate to make such delicious looking treats! Yes. They are practically in your back yard! :) & yep desserts yummilicious! A very interesting and creative appetizer! I thought so too! :) The Sabra chef got the best job. 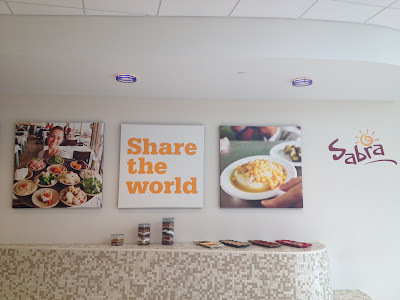 I am a hummus fanatic and am in love with several varieties of Sabra hummus. This chocolate hummus is new to me and looks amazing. Now I can have hummus for breakfast, lunch, dinner and dessert! Great post. Ahahaha me too! Wonder which ones are your favorites? So cool! Sounds like a great trip! Love this hummus-laced dessert!